You probably don't realise that Venus is in aggressive mood in Aries and spoiling for a fight. Pluto, meanwhile, from his sinister realm of dark shadows, is being provocative at just the critical moment and, quite apart from the effect on fiery Venus, is causing jealousy, obsession and control-freak behaviour all over the place. As an inevitable and obvious result, relationships are under pressure. In case you hadn't noticed, all through April Aries' purifying fires have been 'blazing through heavy relationship swamps'. With the full moon in Scorpio on 20 April we are urged to 'watch for juicy essence' rising like an ashes-spurning phoenix. In short, and to borrow from Bill Laurie, there's a good crowd in and it's all happening in the cosmos. Who would have suspected such a maelstrom of emotions, encounters, perfidies and attacks was constantly assembling and re-assembling itself among the apparently innocent stars? Not me, being perhaps a bit slow on the Zodiacal uptake. The astrological narrative is not easy: it makes some leaps, sidesteps and plunges that even the most accomplished and daring fiction writer would jib at. Take astrologer Pascal Le Segretain. He reckons 'Venus ... in her warrior garb (Aries) ... was calling out superpower China (Pluto) for its "hidden" unfriendly human rights policies'. Guessing that 'such events have a longer arc', he has recourse to 'the geo-politically astute author, astrologer and San Francisco resident Jessica Murray'. 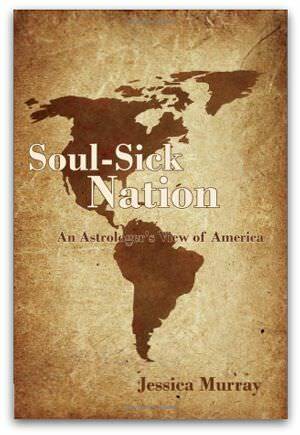 Author of Soul-Sick Nation: An Astrologer's View of America, Murray explains that 'this particular Mars cycle has been hammering away at us for months, going direct-retrograde-direct while opposing Pluto in the sky'. Or, in purely astrological terms, the Moon is in the Seventh House but Non Sequitur is banging on the door. Is that Pluto whirling past with his characteristic dark force or just shards of Russian and American space junk? Mired in the old yearly average routine, I found myself marvelling at the 'collision graphs' the positiveastrology synastry application produced to illustrate the remorseless inevitability with which Paula Yates came across Bob Geldof, then Michael Hutchence; how Charles intersected with Diana and then Camilla; how all of them wished they'd missed the Duke of Edinburgh; and how the Olympic Torch could have avoided protesters by going through Heathrow Terminal Five. Amazing astrological stuff: a zodiacal finger on the starry pulse of the universe. Serious astrologers scorn Nostradamus' complexity, but the venerable Gallic prophet was at a disadvantage. You try translating 'In the 20th century the BMW Series 323i will introduce a locking nut security facility' into Medieval French. Just because it comes out as 'The Russian Grand Bludgeon will persecute the Grey Bears of the Southern Forests' doesn't mean he was wrong. But for all their glib outlandishness and pseudo-scientific jargon, contemporary astrologers still fascinate. This is because they have what journalists call 'a hook'. Listen to this: 'you are capable of reaching the greatest heights'; 'you are trustworthy'; 'you have a meticulous, sharp mind', 'you are a wonderful judge of character'; 'you are a big thinker'. That's me they're talking about. Is there anyone under the sign of Capricorn who wouldn't believe that, especially as it's so accurate. Astrologers in the end tell us what we want to hear. The impossibly distant stars whisper in echoing riddles and astrologers, tuning in, wrap these gnomic, intergalactic ambiguities in a veil of space dust and sprinkle it on our ready-to-be-deceived eyes. So much for stellar philosophy. I'm off to the Swamp of Relationship for a stubby or two of those juicy essences.